Garden design is considered to be an art in most cultures, distinguished from gardening, which generally means garden maintenance. Garden design can include different themes such as perennial, butterfly, wildlife, Japanese, water, tropical, or shade gardens. In Japan, Samurai and Zen monks were often required to build decorative gardens or practice related skills like flower arrangement known as ikebana. In 18th-century Europe, country estates were refashioned by landscape gardeners into formal gardens or landscaped park lands, such as at Versailles, France, or Stowe, England. Today, landscape architects and garden designers continue to produce artistically creative designs for private garden spaces. In the USA, professional landscape designers are certified by the Association of Professional Landscape Designers. Leading figures in early education have always stressed the importance of children spending time out of doors. Charlotte Mason encouraged four to six hours of daily outdoor time. Watching our children grow can be like observing a garden. There are times of quick, blossoming, and far-reaching growth coupled with times of dormant waiting. The garden teaches us patience, presents us with surprises; so too it calls us to pay careful attention to singular and distinct needs of different plants. How perfect a parallel to parenting! Time in the garden provides a much needed contrast to the loud and frenzied mood of the park. The rush of sliding and swinging have their place; the quiet of tending the earth has its own. Children can help with existing gardening needs, or you may choose to start a small garden especially purposed for this time together. Either route will provide an opportunity for your children to cooperate– with you, with siblings, with neighbors– in selecting which plants are best suited to your space. Whether you have a small container garden or entire yards with which to work, your little ones will have to research which plants will thrive in the conditions of your garden. You may choose a pollinator and butterfly garden to attract bees and butterflies, or a succulent garden. Either of these can be done with limited space and will add beauty and togetherness to your time outdoors. If you have “room to grow,” you may wish to plant root vegetable or fruit trees. Lavender is easily grown and attracts pollinators (be careful if there are any severe allergies to bee stings among your family) and aloe is easily maintained and wonderfully useful as a salve for minor burns and scrapes. Whatever it is you choose to plant, look forward to getting your hands dirty. When our youngest was born, a friend enlightened us with an adage from her Chinese traditions and said “Every day, feel the earth.” She encouraged us to make certain our daughter literally dug her bare toes in the grass, in the dirt, every day– this to promote a oneness with nature. 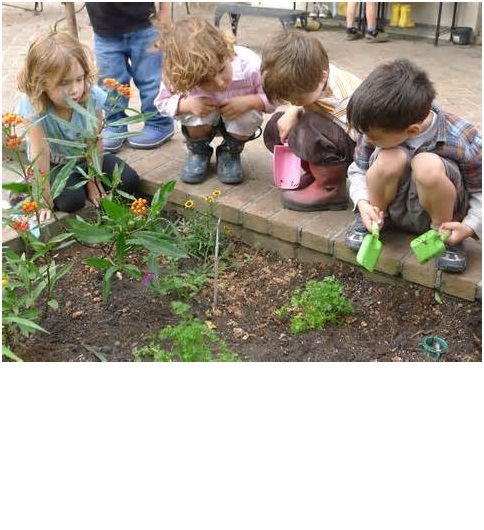 A garden provides a beautiful platform for vivid language and dialogue. We can speak to our children about colors and size, about textures and smells. Hands-on learning does not have to come by expensive science and craft kits– it can happen right in our backyard. Children will learn AND SEE the parts of a plant; you can keep a field journal to describe the growth process and record both information about your garden and the memories time tending it will bring. In a world full of high-tech devices and flashy advertisements directed at children, gardening with them will provide a sense of calm– a sacred space for them to watch life change and grow as we watch them.